Perhaps the most affordable cost effective durable Slatwall Covering available on the market to day. 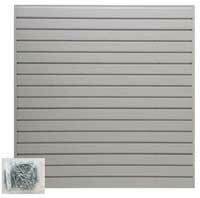 The Melamine Slatwall Panel is available in all of the popular patterns and colors. 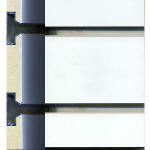 Inserts are either made of plastic or aluminum. The inserts add strength and stability to any panel for applications that need more strength for hanging heavier items or multiple items on one slatwall hook or bracket. Wilson Art is a high end manufacturer or many types of wood coverings with a large selection of colors and patterns. If you have a high end store Wilson Art is for you. Large selection of different color and size Slatwall Hooks plus Slatwall Scanner Hooks. Available in a 24" width and a 48" width with a 13" depth. Configured with a 12" deep slatwall shelf bracket. Slatwall shelf brackets are available in chrome, black and white. Choose from a large selection of slatwall brackets and hangers. Hooks and brackets transform any slatwall display system into a professional and affordable display that can display or merchandise many items from bagged goods to clothes hanging on a clothing bracket. Made out of Plastic PVC and available in many patterns and colors. Stock Color 4' High X 8' Wide. Choose from a large selection of wood grain type slatwall panel coverings.